Jarrod joined B&F in 2002 after graduating from the University of Arkansas in Morrilton, AR. He is a Licensed Professional Surveyor and well as holding a Mine Safety & Health Administration Certification. He is affiliated with the Arkansas Society of Professional Surveyors. 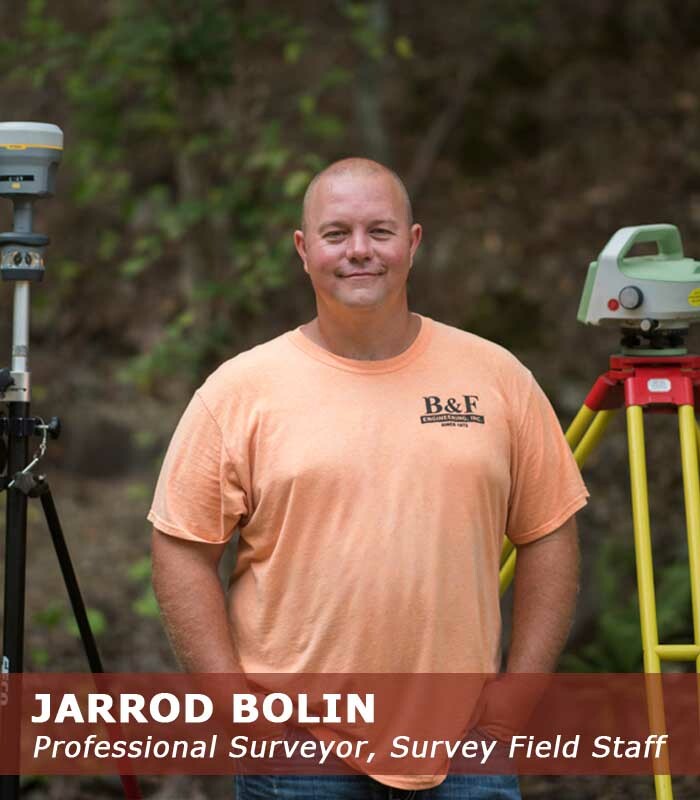 Jarrod is proficient in boundary and topographic surveys while working on projects for clients such as the Corps of Engineers, McDonald’s Corporation, and other consultants on large scale projects. Jarrod currently works primarily on mine reclamation sites and tailings pond closures including topographic surveys for volume calculations, liner layouts, as-built surveying, construction layout, and volume calculations. Mr. Bolin is trained in mine safety, cardiopulmonary resuscitation, and is experienced in working under very strict safety requirements. Jarrod is married and has 2 children.